Online Registration for Class I - 01.03.2019 from 8.00 am. Last date of online registration for Class I - 19.03.2019 till 4.00 pm. Admissions - 08.04.2019 to 15.04.2019. For KV Students - Registration for admission in class XI - Within 10 days after a declaration of board results. For KV Students - Display of admission list & admission for class XI - Within 20 days after a declaration of board results. Last date of admission for class XI - 01.07.2019. 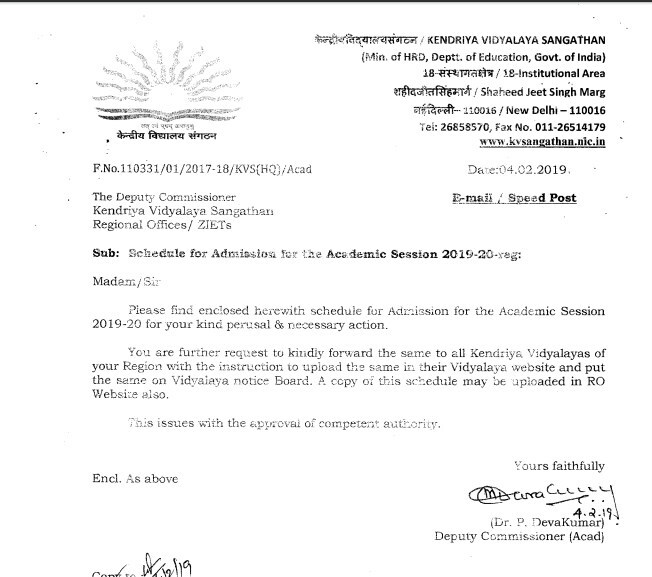 How to apply KV Online Admission 2019 Form? •For Class I, certificate of proof of age in the form of a birth certificate issued by the authority competent to register births. This will include certificates from Notified Area Council / Municipality / Municipal Corporation extract about the date of birth from records of Village Panchayat, Military Hospital and service records of Defence personnel or Affidavit. •For other classes, the date of birth recorded in the transfer certificate issued by a school recognized by the State Education Department would be accepted. The original certificate of date of birth should be returned to the parent after verification. •Admissions up to class-VIII may be granted without any school transfer certificate provided the child is otherwise eligible and his birth certificate has been issued by a Govt. body or affidavit. •For grandchildren of the Honorable Members of Parliament and PSU Employees, a certificate of relationship must be produced. •This is also applicable for grandchildren of KVS employees. •Children belonging to SC/ST/EWS/OBC and BPL categories are required to produce a certificate issued by a state or union government. •Handicapped or physically disabled candidates are required to produce a certificate from a civil surgeon or rehabilitation center. •In case of children whose parents have been transferred a service certificate showing the number of transfers in the last seven years, duly stamped by the Head office with name designation and other relevant particulars in bold letters should be produced. •A certificate of retirement for uniformed Defense personnel. •A certificate of retirement for uniformed Defence employees. Parents are advised to familiarize themselves with KVS admission rules, regulations and guidelines are available at below link. 0 Response to "KV Admission Online 2019 in Class 1 to 11 @ kvadmissiononline2019.in"